Copenhagen the birthplace of the pedestrianization movement? Quite often, a movement will have a starting point and a champion. 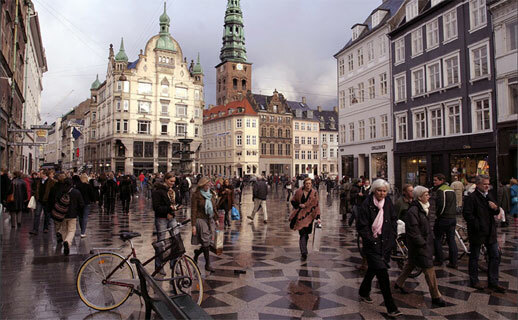 If one had to at least nominate some credit in regard to the pedestrianization of streets, then Copenhagen, Denmark and resident architect Jan Gehl deserve some of the spotlight, especially in a city known for rainy cold weather where the common mantra was ‘this is the wrong city for this’. Jan was a principal figure in transforming Copenhagen’s main downtown street, the Stroget, into a pedestrian zone. The traffic congested street became a pedestrian zone for good in November of 1962 despite merchant opposition, transitioning from a seasonal street closing. However, those fears were quickly replaced by commercial success, and more streets and squares became pedestrian only in 1968, 1973, 1980 and 1992, expanding from 4 acres (15,800 sqm) to 25 acres (100,000 sqm) today as Europe’s longest pedestrian-only street. A quarter-million people now inhabit the downtown streets each day and 36% of residents bike to work via close to 200 miles (over 300 km) of dedicated bike lanes. It’s not a coincidence a poll concluded that the happiest people in the world live in Copenhagen. One measure that Jan tracks, and one we can expect to see more and more of in the near future, is of “stationary activities”, that is, people seated at outdoor cafes, sitting around the fountains, window-shopping or just people-watching. They found that from 1968 to 1995 (that’s quite the study window! ), the average number of such people increased by 330%, directly proportionate to the growth of the pedestrian zone, not surprisingly. Jan’s firm, Gehl Architects, is still committed to assisting cities with their pedestrian networks, with results in Oslo, Barcelona, London and Melbourne. Thankfully, his firm has attracted the interest of North American cities, such as Seattle, New York and San Francisco. Read more in the Canadian Globe & Mail article, A Step in the Right Direction. Image: The Stroget pedestrian zone in Copenhagen, Denmark by GuÃƒÂ°mundur Albertsson.